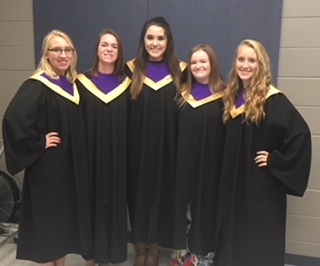 Congratulations to the five SHS students who performed with the Northeast MO All-District Choirs on Saturday. Both choirs had excellent conductors from the passion and humor of Mr. Raynard Brown to the enthusiasm and kindness of Dr. Jim Brown. Spectacular performances were given by all. Pictured from Left to Right: Laura White, Madalyn Bartholomew, Brooke Bartholomew, Emmalee Wyatt, Anna White.